"We want students to have opinions, to be passionate about these opinions, and to defend them with strong, well thought out and elaborated arguments." Persuasion is around us all day long, every day. When you get in the car to go to the grocery store, you see persuasive texts through billboards, bumper stickers on cars, and signs for products throughout the grocery store. When you are at home, persuasion can be shown through the form of magazines, television commercials, movie trailers, or even the back of a book! 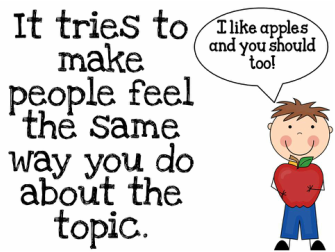 Because we live in a world of persuasion, it is important that we teach our students to learn to understand how persuasion works and how they can use it to their own advantage (Dorfman & Cappelli, 2009). 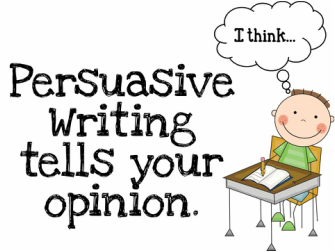 A persuasive essay is an essay in which the writer is trying to convince his/her reader of something. 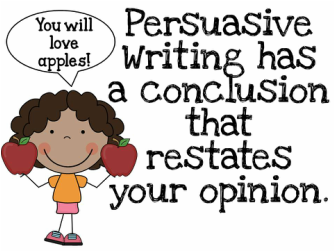 Persuasive essays usually have an introduction where the writer states his/her opinion on the topic, three body paragraphs with reasons and evidence to support those reasons, and a conclusion paragraph. 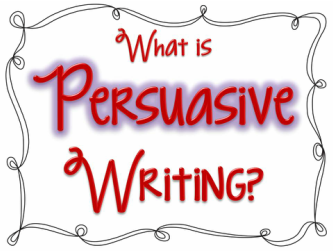 As you will see on this page, there are many ways to introduce persuasion in your own classroom-rather than starting off with an essay format. 1 . 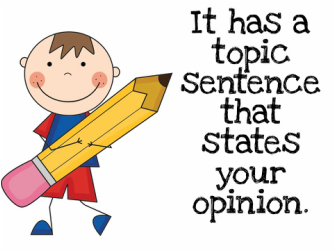 Write opinion pieces on topics or texts, supporting a point of view with reasons and information. a . Introduce a topic or text clearly, state an opinion, and create an organizational structure in which related ideas are grouped to support the writer ’ s purpose. b . 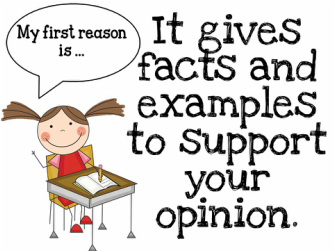 Provide reasons that are supported by facts and details. 2 . With guidance and support from peers and adults, develop and strengthen writing as needed by planning, revising, and editing. 3 . Recall relevant information from experiences or gather relevant information from print and digital sources; take notes and categorize information, and provide a list of sources. Results from this study showed that there are "positive outcomes in student writing as a result of a focus on genre in a scaffolded instructional setting" (Read, Landon-Hays, & Martin-Rivas, 2014). releasing responsibility to students writing persuasive text. 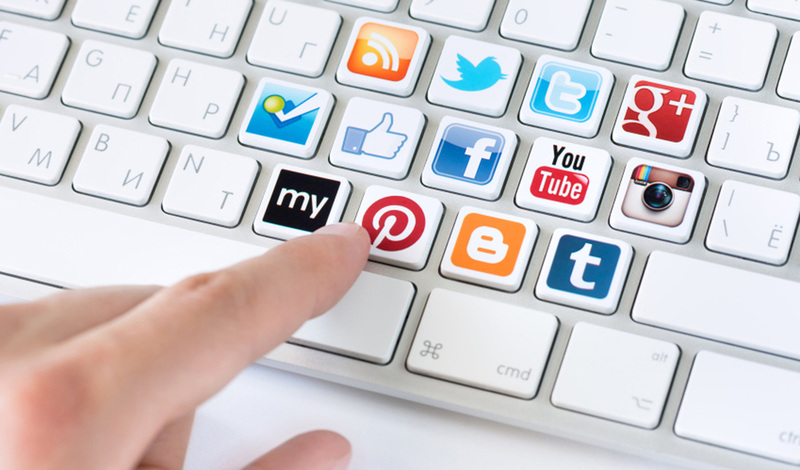 This article explores the possibilities of teaching students the art of persuasion through the use of online media. 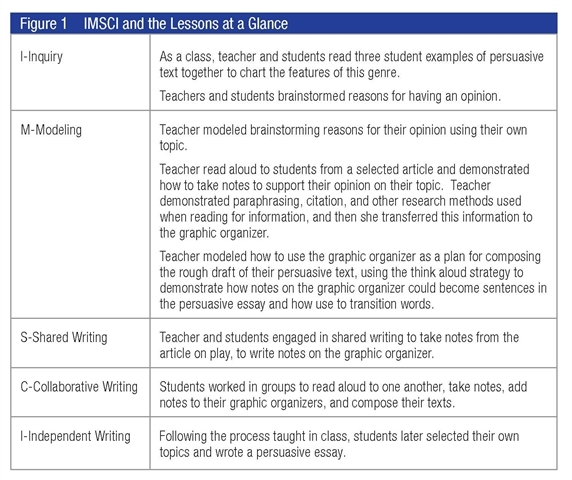 According to Morton-Standish, there are four motivating strategies that are important to engaging students in the process of persuasive writing. The strategies include (1) using online media to create ownership, creativity, and enjoyment in writing extended persuasive text; (2) using online research to support arguments when writing extended persuasive text; (3) using online tools to write extended text for a real-world audience; and (4) using online tools to write extended persuasive text collaboratively and specific teaching examples using online tools to write extended persuasive text (2014, p. 421). These strategies are explained throughout the journal article and have all been linked to the use of the Common Core State Standards. extended persuasive text. Reading Teacher, 67(6), 419-429. Introducing persuasion by having students take a look at the persuasion all around them can be a helpful tool! Students can find their own advertisements in newspapers, online, magazines. Or students can look at the pictures, symbols, and slogans page to the right to see how those images are meant to persuade the reader. As an extension, students can create their own advertisement, magnet, or bumper sticker while thinking of the arguments they are trying to make! Poems can be beneficial to show the varying perspectives and sides of an issue. Students can write Point-of-View poems based on one side of an issue. To get started, students should create a Pro/Con Chart based on a particular topic. The topic can be as simple (such as choosing a book to read or a meal to eat) or as complex (such as abortion) as you or your students choose. The idea is for the students to think of a topic from multiple perspectives. 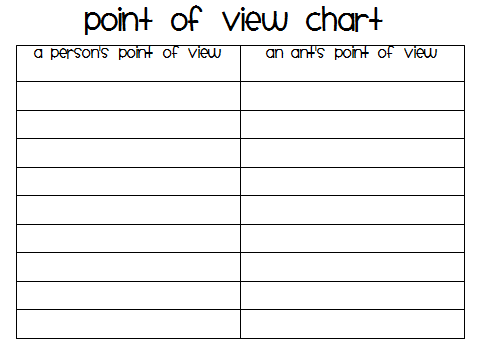 After the Pro/Con Chart is created, the students can take on the perspective of one side to write a poem from that point of view. The student can then do the other point of view as well. When finished, there should be two poems, each offering a different perspective. This will help students to think about the arguments and counterarguments needed for their essays.